Or so we are told by builders over and over again. This trend has now gone on for at least half a decade. In a recent report Liases and Foras, a real estate research company, gave out some very interesting numbers. In 2018, in the top 8 cities of the country, the total number of unsold homes (or what anyone making a living out of real estate tends to refer to as inventory), was 9,43,680 units. In 2009, the number had stood at 2,83,060. The value of an average unsold home in 2009 was at Rs 58.1 lakh. The value of an average unsold home in 2018 was at Rs 82.4 lakh. (Of course, this is not totally the right comparison because we should actually be comparing prices per square foot, given that the average apartment size has fallen between 2009 and 2018. I couldn't find this data, hence, I decided to work with what I had, the next best thing). This is one of the problems at the heart of India's real estate industry, operating in the biggest eight cities (Mumbai Metropolitan Region, National Capital Region, Bengaluru, Pune, Hyderabad, Ahmedabad, Chennai and Kolkata), which account for more than 80% of the real estate business in the country. Home prices were high in 2009. They continued to be high in 2018 as well. The prices have put the idea of owning a home, beyond most middle class Indians, whom the builders operating in the top 8 cities, want to cater to. The product on offer is not something which the broad section of the market wants. The supply is for homes, which the buyers don't want. And due to this the inventory of unsold homes which was at 16 months in 2009, went up to 41 months in 2018. Over and above this, there is a lack of trust. A lot of unsold homes are in the underconstruction stage and given what has happened over the last ten years, where many builders have taken money and disappeared, buyers are just not interested in buying an underconstruction property. While, all this is true, what is also true that home loan growth continues to be robust. Take a look at Figure 1, which basically plots year on year home loan growth for banks, for the last two months. Figure 1 clearly tells us that home loan growth has been pretty good over the last two years. In fact, in December 2018, the home loan growth stood at 17.1%. In 2018, banks gave home loans worth Rs 1,60,447 crore. Banks, on an average, give out around two-thirds of the home loans in the country. The rest is given out by home finance companies, which operate as NBFCs. If we take this into account, then the total home loans given out in 2018, would stand at Rs 2,40,670 crore. If home loans are being given out, then homes should be selling and builder inventory should actually be coming down and not going up. But that hasn't been the case. Why? 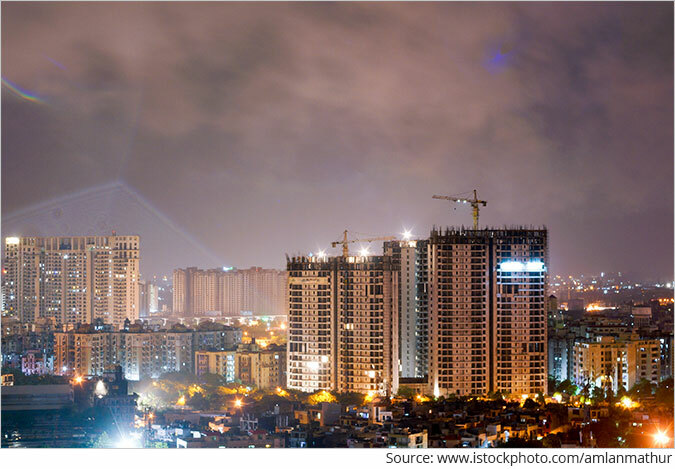 Even at an average price of Rs 82.4 lakh (as calculated above), around 2,92,000 homes (Rs 2,40,670 crore divided by Rs 82.4 lakh), should have been sold in the country in 2018. And at that rate, unsold home inventory should have come down and not gone up, as it has. So what is happening here? One explanation that has been offered is that home loans are financing lower priced apartments in smaller cities, not captured in the data offered by real estate consultants. To achieve a home loan growth of 17% without lending in the big cities seems to be difficult. Let's look at priority sector home loans to check if this makes sense. Before we do this, it is important to define what a priority sector home loan is. The Reserve Bank of India defines these loans as home loans of up to Rs 35 lakh in metropolitan centres (with population of ten lakh and above) and loans up to Rs 25 lakh in other centres. This is to the condition that the overall cost of the home in the metropolitan centre and at other centres does not exceed Rs 45 lakh and Rs 30 lakh, respectively. Let's take a look at Figure 2, which basically plots the year on year growth of priority sector home loans over the last two years, as well as overall home loan growth. Once we take this into account, it is follows that it is the non-priority sector home loans which have been growing at a much faster pace, and form the bulk of the home loans given out. In fact, in December 2018, non-priority home loans grew by 22.1%. What this means is that banks are giving out more and more loans of greater than Rs 35 lakh for homes worth more than Rs 45 lakh in metropolitan centres and loans of above Rs 25 lakh in other centres for homes worth more than Rs 30 lakh. This further tells us that people are buying and selling homes. It's just that the builders are not a part of this transaction. There are three things that buyers are looking for in the current market: 1) Ready to move in properties. A large set of people are simply not interested in buying an underconstruction property, given the way builders have behaved in the last decade. Hence, builder inventories are piling up. 2) Over and above looking for a ready to move in property, buyers are also looking to move into buildings and societies where some people are already living. This is some sort of a check on whether the building or the society has all the necessary permissions. The hope is that someone else would have definitely done the checking. This also explains why buyers don't want to buy totally complete homes lying unoccupied with builders, simply because no one is living there. 3) The third and the most important point is that buyers are now buying from investors who had invested in multiple properties in the past. The reason for this is simple. The investors own ready to move in homes in buildings and societies where people are already living.Also, investors are more likely to offer a cheaper price and be ready to negotiate, than a builder. This is more true about the corporate crowd which took on a home loan, and bought a second or a third home as a way of investment a few years back, and hasn't seen any appreciation in the last six years. They are more amendable to offering discounts and selling the property, in order to cut their losses. To conclude, this explains why builders are in trouble, but home loans are still going strong. At a reasonable price and with the necessary permissions in place, there is still demand for ready to move in homes. We request your view! Post a comment on "Why Home Loans Are Growing, but Real Estate is Still in Big Trouble". Thank you for posting your view! 2 Responses to "Why Home Loans Are Growing, but Real Estate is Still in Big Trouble"
The present price at which properties are sold in India, particularly in urban areas, are all humbug. Even now difference between actual land price and Govt Guideline is 3 to 4 times, which you cannot see in anywhere in the world. Land being state subject, State Governments have deliberately encouraged black money in real estate. This is best area for safe investment of their ill-gotton money by corrupt politicians, bureaucrats etc., and also they can direct the price as they like to make quick return. What is really happening in real estate is common people blood is being sucked by these unscrupulous & corrupt, which is going on for the past 25 years or so.